23 days on….. and its only got worse! 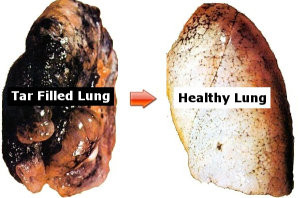 Smokers need to imagine what it is like to fight for your life, to work so hard to get that tiny bit of breath in to supply oxygen to your brain and body. They need to experience this. They need to fast forward 10, 15, 20 years and try taking those precious breaths which they won’t be able to due to all the damage from smoking for many many years. They will soon have to fight for each breath. Only there fight will never get better. Their obstruction will not be reversible it will be permanent, there cough will not go away, the chronic chest infections won’t get better with antibiotics they will be stuck in a downward spiral as their airways get smaller and smaller due to inflammation and obstruction. They will rely on Drs and Nurses to fight to make them better. They will need the help of social services and be left gasping for breath just getting out of bed or standing up. This will all be due to the years of smoking cigarettes. The feeling they will feel are the feelings they make me feel every time I have to pass someone who is smoking. They don’t give a second thought about it. They think I am over reacting about the effect the smoke has one me. They will comment about it being a free country and they can smoke when and where they want without thought of the damage it does to others. They will expect the health service to look after them and some of the people they have made ill will have to be looking after the people who smoked. The day that you fight for your breathe and fight for your life will be the day when you experience exactly what many asthmatics feel like when exposed to smoke. Back on the first of April I questioned wether or not the NHS going smoke free was a big April Fool. 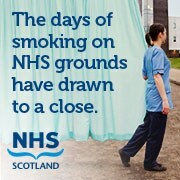 Its the 23rd April and it appears that the NHS are not going smoke free even though they say they are. Rules are made to be broken but this new rule seems to be the easiest one to break of all. 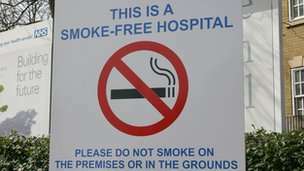 I and many of my asthmatic friends would be the first ones to stand up and rejoice that hospital sites are meant to be smoke free. It would mean so much more than not having to wonder how many times you will need to use your inhaler from taking your first step into hospital grounds to getting inside the door. It would mean no longer having to walk the long way round to find a door not many use to enter the hospital avoiding smokers hovering outside, it would mean being able to do your job or attend appointments without being worse than you were when you left your own house. The list is never ending for the benefits of not smoking. There are no benefits to smoking what so ever but occasionally when I am very frustrated and having trouble to breathe, part of me wishes I had smoked. If I had smoked there would be a physical reason why my lungs don’t work as they should and why I need inhalers, nebulisers and tablets to keep my lungs working. This only comes into my mind when I am sitting awake in the small hours of the morning using my nebuliser wishing there was a cause for all this illness which just now I don’t have. This is why I can not believe what I am about to say. Never in my wildest dreams would I ever dreamt that I would be in favour of revoking the rule and allow people to smoke on site again. I am stunned I would even consider thinking such a thing, but the reality is I would prefer it. I hate part of myself for this as I know what it feels like not to be able to breathe and I watch powerless as strangers choose to inflict damage and give themselves a future of pain and suffering. Since the ban on smoking on hospital sites it feels like there has been an epidemic of people smoking on the hospital site and they are everywhere. Around every corner there will be someone puffing on a fag. It has made getting from the carpark to inside the building a logistical nightmare trying to find doorways which are not clouded in a plume of smoke. At least before there were smoking shelters which were used pretty well and for those who did not use the smoking shelters there were the hot spots where you could find a group gathered. You knew the areas to avoid but now it feels like there is no where to hide from people smoking. The biggest irritation is that no one is patrolling and enforcing the ban. No one is picking people up on smoking and god forbid you take it upon yourself to suggest people did not smoke the looks and comments you got were not worth it. As a worker on an NHS site I despair on many occasions. There are rules for everything and it begs the question why are some enforced and some not. For example parking. You are quizzed about why you are trying to get into a carpark on arrival at the barrier and if it not for a reason that is approved by the car park people you don’t get in. As a community worker based in the hospital I have to take a lot of stock out to patients which can be very heavy. The solution is that it is dropped down stairs and I then bring the car round. The number of times a warden has come to tell me my bumper is over the yellow hashed lines or I am in the wrong place is astonishing. Half the time I spend arguing with them about being allowed to park to pick up stock I would have been away far quicker had they not caused an issue. I would have been creating less of an obstruction. My issue is that there are people enforcing rules which are doing no damage at all and not preventing someone getting treatment or anything being detrimental to someones health yet a ban is in place to stop people smoking on NHS sites and there is no one to enforce it. It is disgusting that they can get away with this. I am sure if I went (wearing a mask and protection) and sprayed air freshener or a substance with an unpleasant smell all the smokers would be up in arms about someone spraying something yet they have no issue making others breathe their smoke in when it could damage their health. I was so annoyed last nigh about it as I suffered a bit of an asthma attack- nothing major on my way home from work as I was rushing to get my haircut, I wrote to Asthma UK, Asthma UK Scotland, ASH and also my local MSP about how the smoking ban on NHS sites has almost caused a bigger problem than smoking was before. At least before you knew were people were and could avoid areas. It was not ideal but it worked. Now previous “safe spots” are a hazard making an already slightly problematic task nigh on impossible. I decided to take action and will await my responses. It may not come do anything but for myself I feel better for expressing how I feel and doing a small part to try and make life better for myself and others who suffer at the hands of those who are selfish and smoke. I feel so passionately about this subject more so than any others because it effects my ability to carry out the care I need to give my patients to ensure they have the best quality of life they can possibly have. My whinge is over sort of!! Had a pretty awful day at work and it has left me questioning why I bother killing myself to do the best job I can. Pushing myself is making my life very restricted. I love my job and I love my job so much that I am prepared to sacrifice some of my free time to rest and recover from hard days at work. But today I really wondered why I bother. Many more days like that its not going to be worth it as I really can’t afford to sacrifice any more of my social time to allow myself to rest and get better and stronger for the next day ahead. I have a lovely weekend planned as it is my Stepmums 60th so we are all going out for a family and friends lunch on saturday and then I have golf on Sunday before more golf next weekend!